I brought together all the smaller piles from around the house. I’ve been on a bit of a cleaning binge lately. Part of this has been centralizing all the magazines that have piled up around the house. Some of them are read but I held on to for whatever reason, others I may have read a couple articles, while others are untouched. But I have no idea which issues fall into which category. Over time, I’ve subscribed to several different magazines. I’ve let some subscriptions lapse as I realize I don’t read them, while others I really really INTEND to read, but it never quite happens. In fact, this particular project was inspired last week, when I grabbed a couple random magazines off the pile and threw them in my commuter bag. On the way home, I pulled one out and saw the “Merry Christmas” headline on the cover – it was a December 2009 issue. I do have two hours of reading time on the train daily, but mornings are for the newspapers (the Tribune and Elgin Courier-News). Evenings are for overflow from morning, a bit of work, and books. 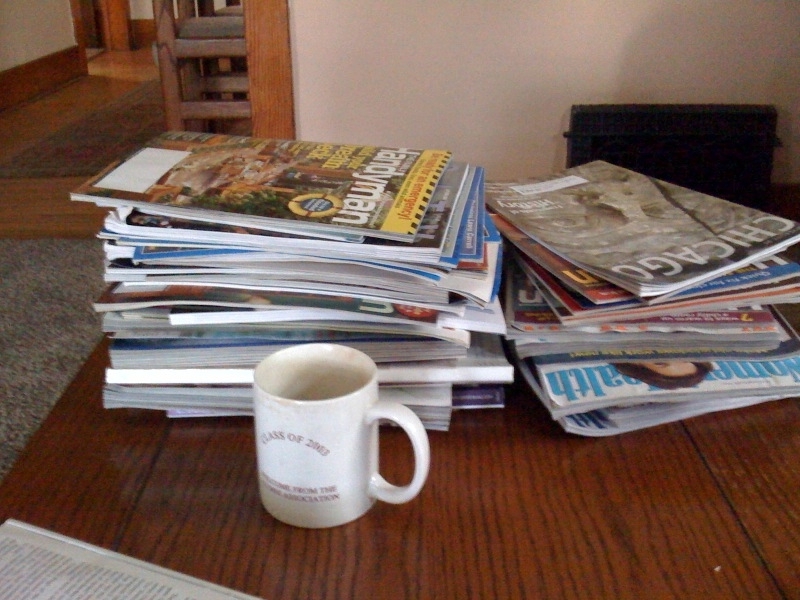 I try to slot magazines in between the books, but as you can tell by the pile, it doesn’t always happen. So what’s in the pile? Clean Eating Magazine – A relatively new discovery (I just got the second issue), but I love this one! It’s nearly 100% content with very few ads, beautiful pictures, and chock-full of good recipes, shopping guides and nutrition news. I love that many of the recipes are relatively quick and easy. (They claim 20 minutes; I find 30 is more accurate, but I’m slow and that’s still not bad for a weeknight.) Plus, they’re things I actually enjoy eating, with enough “new” foods that I’m always trying something different. Try the Ginger Chicken with Cilantro & Lime. Family Handyman – My boss got me hooked on this, and it’s great. I always get good, practical advice. Several issues are still in the pile is because they’re useful or I plan to tackle one of the projects. A recent issue had a closet project that I’m eager to start. National Review – Still standing athwart history, I’ve been reading NR on and off for a decade. I love the content, but it’s biweekly and I just can’t keep up lately. But going into an election year, I may shuffle it up in priority. Women’s Health – I’ve been subscribed to this for the past year or so, ever since I started my new fitness and health regime. It’s very fluffy, but has interesting, easily digestible tidbits, good recipes and always has several fun, different body-weight exercises to try. City Journal – I’ve read their website on and off for years, and really enjoy the in-depth articles about urban policy and economics. And when I first subscribed, I loved the beautiful quarterly publication. But really, there doesn’t seem to be anything in the print edition that isn’t online, and since it’s so heavy (printed on beautiful, heavy, glossy stock), I found myself lugging it around for weeks. I didn’t renew my subscription, but there are still a couple issues in the pile. The University of Chicago Magazine – My alma mater’s monthly publication. It magically shows up, and it’s interesting. I always flip straight to the back and read updates on classmates, and then usually skim through some of the articles. Then I set it aside. Lowe’s Creative Ideas – This (free!) bimonthly publication is pretty skinny, but has pretty pictures and some good ideas. I keep holding out for the day they include coupons. Angie’s List Magazine – I subscribed to their service, which comes with a free monthly publication. Then I discovered that they have relatively few reviews for businesses as far-flung as Elgin. I won’t be renewing this one. I never subscribed to any of these, but they started appearing. I’ve never received invoices for any, and I’ve called each to be removed from their lists, but they keep coming. If anyone has any interest, let me know and I can set them aside for you. Otherwise, they go straight to recycling. Sports Illustrated – I keep getting “this is your last issue!” notices, but unfortunately, they lie, and it keeps arriving. Spin – This one has stopped (for now). So that’s my pile. What’s in yours? What must you read every time it’s published, and what do you plan to let lapse? Dang, you have some real magazine ambition! I love Clean Eating, and am intrigued by Handyman, but I live with a project-loving engineer who rarely finishes anything, so I’d be scared to bring that one home! We get Newsweek and Atlantic Monthly via NPR memberships…I rarely read the Newsweek, and maybe make it through half of the AMs. I’m a lousy magazine reader. Pretty much exclusively a Kindle reader these days, though I don’t read much in the summers since I bike instead of train riding downtown. Not so much ambition – I stumbled into this problem over time! I read Newsweek throughout high school, then Foreign Affairs through (and immediately after) college, but let those lapse. Also used to get Verbatim, a quarterly word nerd journal. I’ve thought about a Kindle to help solve this very problem – I might read more of them if I actually had them all with me at one given time rather than having to pick and choose off the top of the pile? Smithsonian, American Heritage, American History, National Geographic, the magazine AAA sends out, Old House Journal (this one is really good – you should get it! ), Cooking Light. Was getting Modern Photography but am letting it lapse. Frank reads his Wall St. Journal on the train. I skim that when he brings it home at night. I skim the trib. in less than five minutes – not enough there to really read. Wow, you’ve got quite the list, Jody! I agree on the Trib – it used to be much larger. Now on Mondays and Tuesdays I can read that plus the Courier and still have 10-15 minutes left before I get downtown.